Edwin van der Heide wins Art+Technology Award | Esc.rec. Edwin van der Heide wins the Witteveen+Bos Art+Technology Award 2009 (congratulations, Edwin)! For people interested in attending the award presentation in the Bergkerk in Deventer on the 12th of November, please read this invitation (pdf) and register for the presentation of the award through communicatie@witteveenbos.nl. The Art+Technology Award will be presented by Harry Webers, general manager Witteveen+Bos on 12 November 2009 (17.00 hrs). Furthermore Andrée van de Kerckhove, chairperson of the jury, will amplify the nomination and Bas Haring, writer and philosopher, will give a short dissertation on the subject art-science-technology. 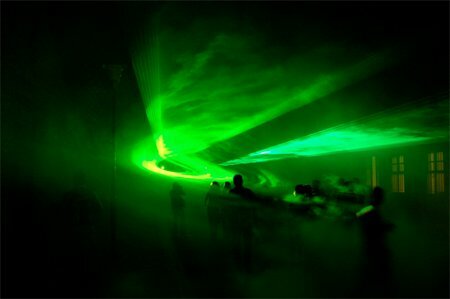 The presentation will be followed by one of Edwin van der Heide’s Laser Sound Performances. From 13 november till 3 december a new installation, especially developed by Edwin van der Heide is shown in the Bergkerk. Really good to see Edwin van der Heide back in Deventer! Back in 2004, only a few people showed up for his performance when I booked him for one of the J’ee-haw! Sunday Matinees in the IJsselhotel in Deventer. I suspect his work will attract a much larger audience now! that looks very nice! wish i could see this performance! lasers and sounds are a perfect and wicked combination!